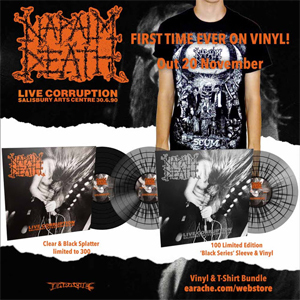 Live Corruption, by NAPALM DEATH, will get its first ever vinyl release on November 20th via Earache Records. A preview trailer has been released and you can check it out below. The album was originally only included on CD in a limited edition box set that was issued back in 1992. It was recorded in 1990 at Salisbury Art Centre, England with the classic lineup consisting of Mark "Barney" Greenway, Jesse Pintado, Mitch Harris, Shane Embury and Mick Harris. You can pre-order this special vinyl release at the Earache webstore right HERE.